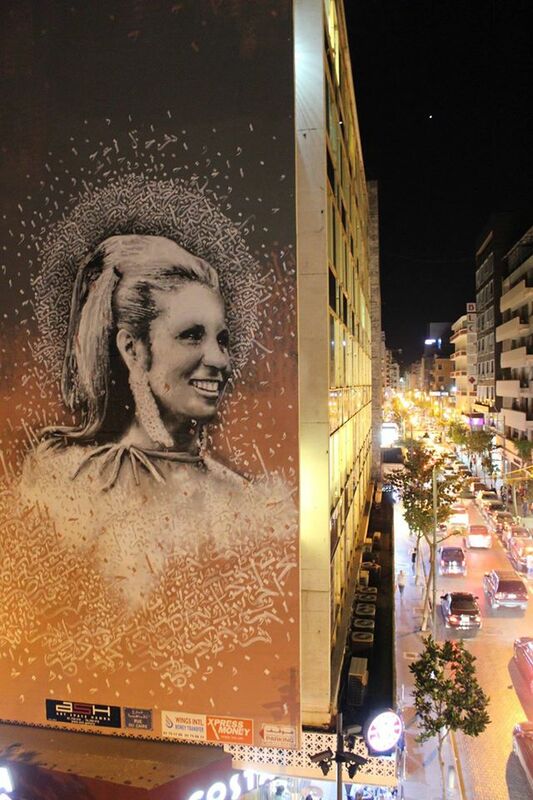 Yazan Halwani, a graffiti/street artist born & raised in Beirut, Lebanon, painted a grand mural in Hamra, Beirut as a tribute to the legendary Lebanese singer Sabah who passed away in November 2014. The mural shows the singer smiling, revealing her friendly character and a great welcome to those entering Hamra street. 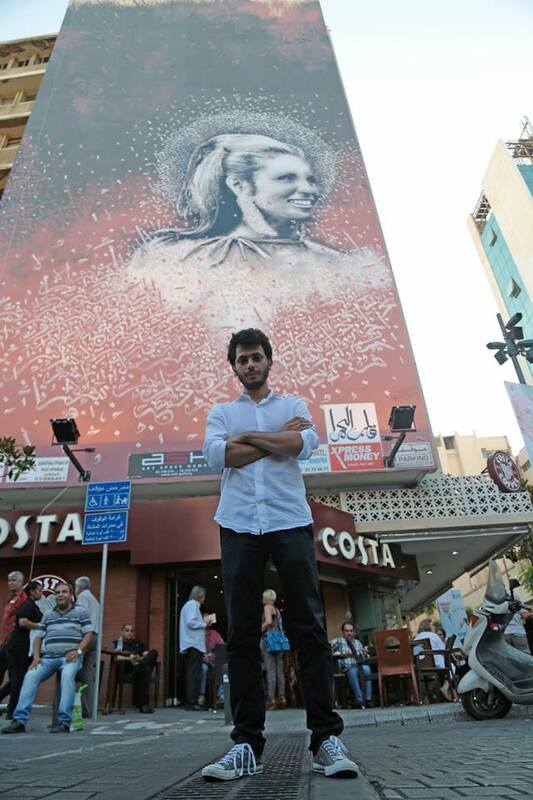 On his facebook page, Yazan explains his art work: “I painted the legendary Sabah on one of the largest murals in Beirut to immortalize the woman that was loved by all and was able to challenge the rules of society. She was not only an “icon”… I think we need to take Sabah’s drive in modern society, break taboos when need be and not be held by norms. This mural was painted on an iconic building of Beirut pre-war era, the “Heart Of Hamra” is a building that earns its name: Before the Civil War it hosted the legendary Horseshoe Café, a literary café where Nizar Qabbani, Paul Guiragossian, and many Arab artists and intellectuals used to sit. After the war, Hamra started slowly recovering but was never able to become the Arab cultural hub it once was, this mural is an attempt to bring back that era. Shown here are some of his other very famous works, you can check his instagram & facebook pages to view more. Links provided below. Yazan Halwani is a graffiti/street artist born and raised in Beirut, Lebanon. 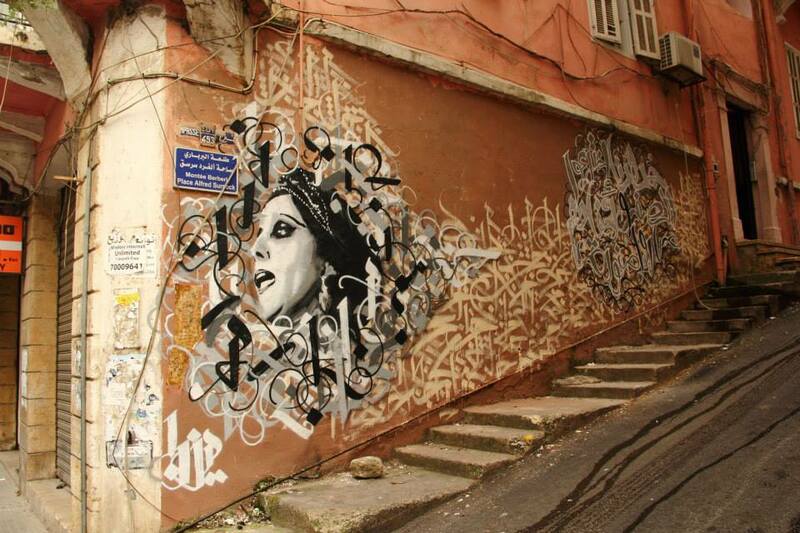 After an initial debut in 2008 with western graffiti, he quickly changed his style to a cultural expression of his environment using traditional Arabic calligraphy with black and white portraits that express the cultural face of cities. His murals try to preserve the cultural heritage of the Arab world faced with increased westernization by showcasing distinctive oriental influences: intricate geometric patterns, Arabic calligraphy and portraits of Arab people. 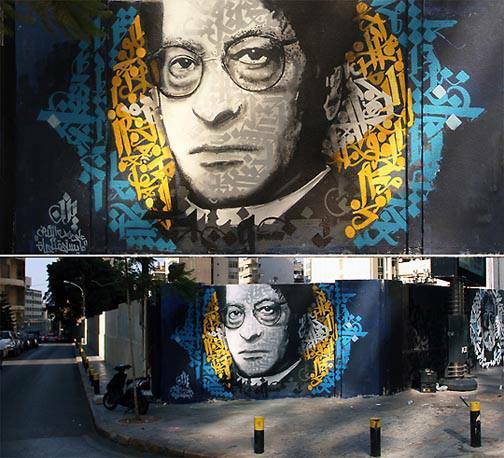 Yazan’s mural are distinctive by their incorporation to the city and their strong social or political message relating to the current context in the world and specifically the Middle-East.